If you live in the Cook Memorial Public Library District, apply for a library card at any of our locations. All residents age 4 and older are eligible. Library cards are valid for three years. Check which library district your residence is in. A photo ID with official information that shows current name and address. A driver’s license or state ID card with current address is sufficient. What if my photo ID doesn’t show my current address? For address verification, please provide one of the following documents in addition to your photo ID. I have photo ID and proof of address, now what? Visit the Check Out Desk at either library location or the Bookmobile to complete and sign a library card application form. You will be issued a library card. That’s it! Children 4 to 13 years old must be accompanied by a parent or guardian when applying for a card. The parent or guardian must show photo identification and proof of residency in the library district. Youths aged 14 to 17 must show proof of residency with photo ID or be accompanied by a parent or guardian who can show proof of residency. Parents are responsible for materials checked out on their children’s (aged 4 to 17) library card. You may use your card at other Illinois libraries. Check with the local library at your destination. You’ll need to register your card at the library you are visiting. To register a card from another Illinois library, bring your valid home public library card and a current photo ID to any of our Checkout Desks. Your library card will remain active in our system for one year based on the expiration date given by the home library. Please note that some items and services are reserved for Cook Memorial Public Library cardholders only. 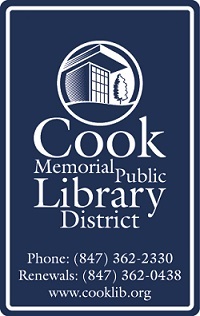 Cook Memorial Public Library District card: Bring your library card and photo ID, with proof of in-district residence, to the Checkout Desk at one of our locations. Reciprocal borrower (out-of-district) card: Update your account at your home library district, then bring your card and photo ID with current address to the Checkout Desk at one of our locations. If your card is missing, notify the library right away since you’re responsible for any activity on your account. Call 847-362-0438 or visit the Checkout Desk. Replace your card for $2. See Borrowing Materials for information on loan periods, placing holds, and fines.